Fraser fir trees are a type of fir tree that is cultivated for use as Christmas trees. Fraser firs may succumb to or be damaged by a number of pests, amongst these are rosette bud mites. What are rosette bud mites and what methods of rosette bud mite control are there for the grower? 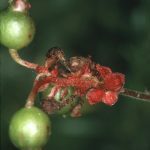 The following article contains answers to these questions and other information on rosette bud mites. 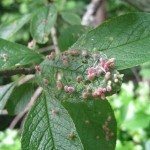 What are Rosette Bud Mites? Rosette bud mites are eriophyid mites that live inside Fraser fir buds. Eriophyid mites are different than other mites, such as spider mites. They are worm-like with a wedge shaped body and four legs on their anterior end. They can only be seen with the aid of a microscope or hand lens. Their feeding causes galls to form in the vegetative buds. The mites emerge from the prior year’s gall during spring bud break and then either drop to the ground or are windblown onto healthy shoots. Rosette bud mites then feed at the top of the shoots, which distorts the bud, forming a gall instead of a bud the next year. Reproduction occurs in the gall throughout the year with as many as 3,000 mites inside a single rosette bud by winter. Rosette bud mites, while not lethal to the tree, affect the quality of the tree. In the case of commercial Christmas tree growers, infestation of the mites and the resulting drop in grade can make the trees unmarketable. The effect of a heavy infestation is obvious, creating stunted uneven growth. Bud mite symptoms may look similar to damage caused by the balsam wooly adelgid. To distinguish between the two, look for adelgid nymphs or adults at the surface of the bud, and cut open the bud to look for resident rosette bud mites. Hopefully, you find bud mites and not adelgids, which can be deadly to Fraser firs. Rosette bud mite control is difficult since the pests reside inside the Fraser fir bud. The upside to treating for bud mites is it allows you to control other Fraser fir pests (except Cinara aphids) at the same time. Commercial Fraser fir growers inspect young groves of 2 years or younger, annually for bud mites. Then an estimate of the percentage of afflicted trees is made in the fall. If the grower deems that the infestation needs to be controlled, the trees will be treated with insecticide the following June. Insecticides are either sprayed with hand held, high-pressure equipment or tractor driven air-blast mist blowers. Mist blowers are not recommended for heavy density groves. The only single application treatment is with dimethoate. Sevin and Metasystox-R are may also be effective in a two application rotation two weeks apart. Rosette bud mite populations can also be reduced in smaller trees by not interplanting young trees with old. Also, overall tree health reduces the risk of rosette bud mites. Practice good fertilization and shearing the trees early. Harvest infested trees early to reduce the populations of bud mites the successive year. There are no biological controls, such as natural predators, to reduce rosette bud mite populations, most likely because the mites spend the majority of their life cycle within the protective gall.